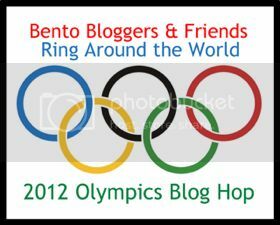 The Olympics Opening Ceremony is today and some bento blogging friends have arranged a fun blog hop. At the end of the post click on the link to see some more fun Olympic themed lunches and snacks. I made this quick lunch for Amy to take to camp. The Olympic rings seemed like they might not be filling enough so I included a few mini sandwich rounds that I had punched out to make the rings. I included the horse shaped melon to represent one of the few athletes we have in the Olympics. I made some homemade picks for these. It was really simple. I printed the Union Jack and the Bermuda flags on some paper and then I wrapped them around a couple of toothpicks and covered them with tape. These are only one time use picks but they were fast and easy to make. The red mini cup was a plain red one, I printed the London 2012 mascots on a piece of label paper and then created a themed cup. The sticker peeled off after and then I had my plain red cup back to use again. These were a couple of quick after swim snacks. We had a week off from swimming lessons and they have resumed this week. It's been a busy summer so far, I am looking forward to a little relaxation in August before the back to school rush begins. More after swimming lesson lunches. Heidi and Rose had the same. These are from Wednesday. green grapes, strawberry & blueberry "flowers"
Some very simple bento snacks for after swimming. Rose's is in the black bento and Heidi's is in the pink bento. They are virtually the same. Swimming lessons are going great. Rose won't jump off the diving board by herself though! She's too funny. She stands there all ready to go and then shakes her head no and wants to hold someone's hand when she jumps. Hoping for a big jump tomorrow!! Yup. You read that right. #69 on our family fun list is to eat only ice cream for dinner. Well we did it last week! We all had Banana Splits for dinner. I set up a 6 cup muffin tin with several toppings, mini chocolate hips, cherries, rainbow sprinkles, chopped nuts, gummy bears and Butterfinger crunch bits. I gave the girls each a split banana with ice cream on it (no banana for Amy - she doesn't like them). Then I let each of them put on their own toppings. I added whipped cream, chocolate syrup, strawberry syrup or Dulce de Leche upon request. This was the most fun we have had at dinner in a long time! I am sharing this special dinner in tribute to Ryan Roberts who passed away on July 8th. You can read more about Ryan's Banana Split Party here or sign up on the Facebook page here. Rose & Heidi's late snack-early lunch for after swimming lessons. They are nearly identical. Rose has been really happy with a sandwich everyday all of a sudden. Maybe it's because she is so hungry after swimming and then she gets something different for lunch a bit later. I dunno but I'm not questioning it -- sandwiches are so much easier for me! This is the cutter that I used to make the 3 little hearts. It's very easy. Since it's deep and metal you can easily make the whole sandwich and then cut it out, use a knife to make three cuts transforming it into three little hearts. Feeling kind of squirelly this Monday morning. I didn't plan on making a 3 layer sandwich. I guess I was in a bit of a Monday morning daze and I buttered the wrong side of the bread! I just cut another slice of bread, buttered the correct side and then made it into the top of the 3 layer sandwich, using the other pieces as a middle and bottom slice. How do you butter the wrong side of the bread? Very easily if you are using cut out shapes that only match up a certain way! Since I was using the regular Wilton cookie cutters I cut the bread before making the sandwich. Usually I am making 3 or 4 sandwiches at once and I stack the slices of pre-cut bread correctly right away so that I don't mess up. As I was only making one sandwich, I didn't do that today so the 3 slice sandwich was born. Amy thinks it's great and she couldn't wait to see if it would fit in her mouth. 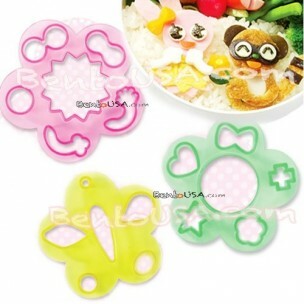 The squirrel shaped cookie cutter can be found in this set and these are the cute squirrel picks. Elephant snacks & a local find! Two snacks for my little swimmers! Heidi wasn't swimming today but she still had the same as Rose. She wants to have her turn everyday like her sister, but the little one's group lessons are only Monday and Wednesday so today we watched Rose's lesson. the same except cheese sandwich. You might not know this, but Heidi is a Dora fanatic. She loves anything with Dora on it. When we were out shopping a week or so ago she saw this little sandwich container and a pair of Dora socks that she just had to have. I am pleased to say that it's a perfect little snack container, or hot lunch day "sides" container. It fits 4 silicone cups perfectly and the lid snaps on with more conviction than our other ones. It is also easy enough for her to open. They were $4.55 at Pheonix Kids. There were a few other characters too. Something was up with my camera. I couldn't take a decent photo. Hopefully I will have time to see if any of the settings are off before I use it next. I am not skilled in photography anyway so it's always on automatic. It was very weird today. These were the best ones and I took several!!! A fun monkey lunch for Amy. Sorry for the horrendous photo. Amy was about to run out the door to go to camp and I was just trying to snap a really quick photo. Her tooth is very wiggly, so I made her pudding as it's very soft. When I grabbed a mini cup to put in some sprinkles it was the little monkey that caught my eye, so I decided to make it a monkey themed lunch. I didn't plan this out very well for a spur of the moment lunch as it took a little more time than I had in the morning - but it's just so cute it was worth the rush. I can't take any credit for the sandwich design -- I saw it ages ago and knew that I wanted to try it one day.When I thought about making a monkey theme it came to mind immediately. Here is the fabulous original. It was made by Lise of Veggie Bento. She has so many cute ideas. This is another favourite that she has made: Earth Day Tree Hugger. These are the cutters that I used to make the Monkey sandwich. honeydew melon, plum slices, strawberries, last 2 cherries! Her wiggly tooth came out so this is the last of the pudding for a while. I put some rainbow sprinkles in the little clover cup and then decided to give the whole lunch a little lucky clover flair. I didn't really notice until I was colouring it in that the cookie cutter I used on the sandwich wasn't a matching lucky 4 leafed clover. I thought I would be sneaky and use a cookie cutter to stamp the outline so I wouldn't have to free hand draw the shape. Well I guess they can't all be lucky 4 leafed clovers! #91 on our Family Fun List is find a four leafed clover. We've been checking our clover patch -- no luck yet! These are for after swimming lessons. Heidi & Rose are famished after swimming lessons. Yesterday, I made them a little bit of a mini lunch style snack to be more filling. They ate everything after swimming lessons and then I gave them a regular lunch a bit later than usual. I think this will be a good plan for our swimming lesson days. Two sandwich rounds are made from one piece of bread so together it equals half a sandwich for each child. We had a bit of a late start this morning so I made an easy little lunch for Amy to take to camp. This is day 2's lunch of Classical Ballet Camp for Amy. I forgot to take a photo yesterday of lunch for day 1. The mornings feel busier than school mornings as I have to get Amy to camp through the Hamilton busy traffic, and then take the others to swimming lessons a good half hour away. Hopefully we'll get our routine sorted out soon and it won't feel like such a rush. I definitely feel quite spoiled that we have never had to face that busy morning traffic before! I certainly wouldn't want to do that every day. I actually made two more star mini sandwiches but as they didn't fit neatly, Heidi ate them with her breakfast! The star cutter feels like it waste a bit too much bread otherwise. As I made my sandwich first and then cut it out it wasn't the kind of bread to freeze and save for bread pudding! I made the Greek yogurt star last night. I left some white and filled a star cutter, then coloured the rest pink and filled it in around the side. Then I removed the cutter and tried to fix it a bit with my knife as it didn't come out like a perfect star. Next, I froze the whole thing so that it would be nice and cold by lunchtime the next day. I always put a frozen ice mat in her lunch box but it just seems so hot out that I'd rather give it that little extra chill. I put a little paper towel underneath in case it sweats as it defrosts. I don't want her to end up with mushy popcorn! I also put a little spoon in her lunch but it wasn't in the photo. I have noticed some other bloggers making frozen yogurt shapes in a little mold. That looks super fun and I am going to give that a try too!